There are 13 cards in total. 10 regular ones (red) and 3 special cards (yellow). The cards are unique, and thus won't drop as random loot. what do they do?Some mission? 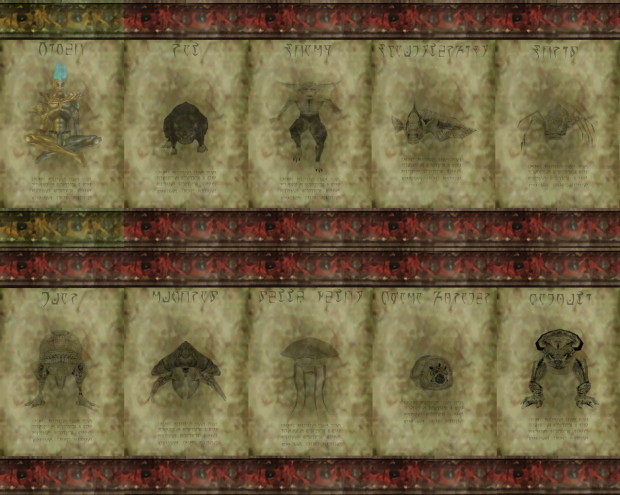 The elder scrolls prophesize that these 10 heroes shall rise up to godhood (even Vivec, who is a house-dunmer shill). Do they grant some scripted bonuses? Like if you obtained/have them in your inventory, you'd get some bonuses. as zoltankai suggested maybe they could work kind of like magazines in fallout? giving you a minor permanent buff for collecting them? I think it'd be cool if they had monsters only found in lore, and not Morrowind / Vvardenfall. IMHO, more cards, the better, especially if there's a place to store them. I'll probably add more cards in the future, so I'll keep your suggestion in mind.